The Catholic Church is one of the most preeminent providers of immigration services in the U.S., even to those who do not adhere to the Church’s teachings. However, in Cloven Tongues by writer/producer Victor Lesniewski, which is being performed at The Wild Project in the East Village of New York City, a priest and a social worker attempt to help a foreign woman with an unknown past seek asylum but find that their attempts to heal her both mentally and physically shake their concepts of trust and faith. Lela (Ema Laković) is a dour woman facing deportation after being caught on the Canadian border attempting to traffic drugs. Both Jenny (Catherine Curtin, Orange is the New Black) and Father Ronnie (Casey Biggs, Star Trek: Deep Space Nine) believe that Lela was forced to do it and want to fight for her to stay in the U.S., but the stone-faced Lela provides them with very little information. When she does speak, her curt responses and unknown accent suggest that she is a woman who has faced many hardships. Father Ronnie is convinced that he can break through to her and at first tries to subtly introduce God into her life as an attempt to comfort her. However, Lela seems to have a deeper connection with Paul (Alex Mickiewicz), a likable, skittish young deliveryman for the local grocery store. Though Lela’s past relationships have scarred her to the degree that she has lost the ability to trust, each of the main characters also have been hurt with issues of trust in their pasts. In particular, Father Ronnie laments on how he never experienced a specific moment that “called” him into the priesthood. He is not the only character who ends up questioning the purpose of his life. In fact, exactly why both Father Ronnie and Jenny are so adamant to help Lela is one of the play’s most intriguing narrative threads. Catholic priests tend to be easy targets for writers, and though Father Ronnie is not perfect, Lesniewski’s writing and Biggs’ portrayal prevent Ronnie from being the sinful and/or tortured priests that are so common in fiction. Biggs’ Father Ronnie is affable (literally so — he even opens with a joke) and truly does want to help Lela at first, but Biggs never lets the audience forget that he is missing that moment that compelled him to become a priest. Though Biggs and Curtin are the most well-known and experienced performers, the narrative focuses on Laković’s Lela, though there are rare moments when her character is not on stage. The middle of the narrative is marked by flashbacks to a decade prior that inform about Lela’s past. These rapid flashbacks are presented as snippets and give Biggs, Curtin, and Mickiewicz the opportunity to impress in roles that that are very different than their primary characters, which is especially advantageous to Mickiewicz because his primary character is otherwise painted with a broad brush. It also suggests why Lela does not trust the people around her in the present day scenes because they are somewhat familiar to figures in her past (obviously because they are played by the same actors). Laković portrays Lela with a face so full of bleakness that the few moments that she smiles are powerful. In fact, despite the play’s grim subject matter it is surprisingly comedic, particularly because of the eccentricities of Mickiewicz’s Paul and Curtin’s Jenny. Yet those same attributes that makes their characters humorous (Paul’s immaturity and Jenny’s overemotional pleading) also ties directly into their dramatic flaws. Only through a combination of effective writing and a skilled cast can such a consistent tone be maintained while the audience’s reactions change due to circumstance. The time-jumping in the middle of the play, which contains both flashbacks and flash-forwards, could have made the play very confusing, but director Michelle Bossy has staged the production in a way that makes it easy to follow for the audience. The scenic and lighting design (by Heather Freedman and Nicholas Houfek, respectively) effectively transports the stage to a war-torn region thousands of miles and a decade ago with seemingly minimal effort. Of course, anyone who has been reviewing theatrical productions as long as I have knows that it takes a lot of effort to make something happen so seamlessly on stage, which is a huge credit to the design team. It is easy to get lost in the shuffle in the downtown theater scene, and though The Wild Project theater has less than 100 seats it is a remarkably professional venue — both in its visual presentation and with the performances its puts on its stage. 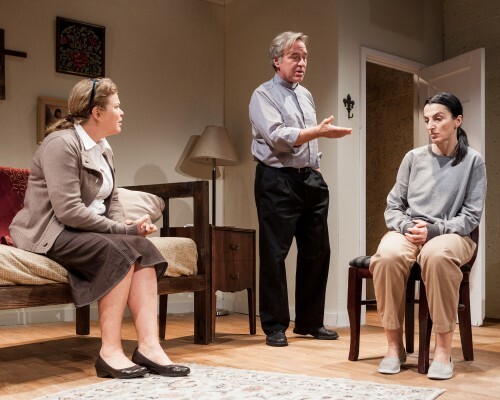 Other theater companies could learn a lot from the production quality of the performance of Cloven Tongues, the strength of Lesniewski’s writing about bleak hardships, and, most of all, an excellent cast who fearlessly plunge into the material. Cloven Tongues runs at The Wild Project (195 East 3rd Street) through November 23. Performances run Tuesdays through Sundays. See out http://www.thewildproject.com for more information.